American film director, Darren Aronofsky in collaboration with the famous producer and writer, Ari Handel, brought us the 2014 hit film “Noah”. The film was based on the biblical story from the book of Genesis. Aronofsky, Handel, along with their highly acclaimed cast including Academy Award winner Russell Crowe, Academy Award winner Jennifer Connelly, Emma Watson, Logan Lerman, Douglas Booth, Dakota Goyo and Academy Award winner Anthony Hopkins brought this timeless and profound story to the big screen for audiences all around the globe. As co-writer of the screenplay (along with Aronofsky) Handel gave us the inside scoop behind the thought process of writing the film. What was your intention behind writing the film? Why choose the Noah story to write about? Talk to us about the process. Well, first off, it is a great story. It is very powerful and everyone has heard about it before at one point or another. It’s a great story about the end of the world and about good versus evil. It’s a story that shows the profound nature of mankind and inward battles that we all face. It also is a story that shows the impact of the divine and the sacred. Honestly it’s overall just such an amazing story I can’t believe it has never been told before in this medium, as a film. What type of conversation do you hope to evoke through the film? I really can’t say that I had any one conversation in mind. I think the story of Noah in Genesis in the Bible really asks a lot of questions within the story. As a filmmaker, I hoped to take the story and use it to entertain but to also dramatize it and get audiences to grapple with the questions that the story of Noah brings up about mankind. I wanted audiences to revisit the story of Noah and look at it in a new, fresh and relatable way. I want them to really take a look and think about the deeper and broader questions that the story brings up. Why is it important for people to see this film? Does it have a purpose? As a filmmaker I feel like I can’t really say it’s important for people to see it but I hope people see it and want to see it. People can and have to decide for themselves if the story is important to them personally and something they should see. I think if the story of Noah and the meanings and lessons behind it is something you are interested in and is important to you then it would be a great film to see. How can this film make a difference in today's society? Again, I think that that is a lot to ask of a movie but the story of Noah is fundamentally a story about second chances in life and for mankind. I want people to see the film and think about second chances. I want them to think about how we are doing with our second chance as mankind. 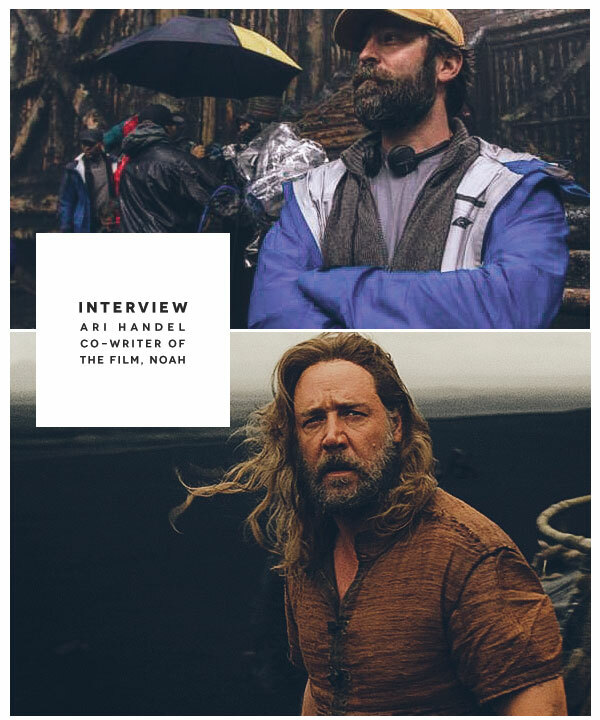 I read in the production notes for the film that “the creative teams aim was clear: to forge a contemporary experience of “Noah” that was immediate, vibrant and personal”. Do you feel the film portrayed the story of “Noah” in a more modern and relatable way? Which aspects of the film in particular did you want to be portrayed as contemporary? A modern audience is only going to be able to relate to a film in a modern way, in a way that they understand. That is a challenge you have as a filmmaker with a big budget, special effects film. We want to make the film through a lens that people seeing it today can understand it. Obviously the setting is not modern but the ideas can be, in the sense that we wanted Noah to be portrayed as a real man that has relatable issues with his life and family. The production notes for the film describes Noah’s character in the film as “an imperfect man whose awe-inspiring task grapples with the worst of humanity while affirming our faith in its best.” Is faith of this kind, particularly in regards to faith in the Bible something important in your life that you wanted to share with viewers? To me the aspect of letting Noah really grapple with issues was important to show to audiences so they could relate to and be moved by his character. It would be one thing to put Noah up on a pedestal and then audiences would just admire him as an almost inhuman and heroic being but he wouldn’t be relatable at all. If you put him at a very human level though and show his struggles and how he comes to decisions then he becomes not just an idol far above us all but someone that we can relate to, see ourselves in and admire. Noah is a very complicated story and man. When he first arrives on land after the flood the first think he does is get drunk and pass out naked so we wanted to show that there must have been an interesting story from before that lead up to that happening. We wanted to really get into and show that Noah was not all good, he was a real man with real struggles and we wanted to portray that side of him. Where did Aronofsky, the crew and yourself draw inspiration from for the way you handled both visual effects and the script for the parts of the story that were not mentioned in the bible but were depicted in the film? Particularly dealing with the story of Noah and his family while they were on the ark. We really got our inspiration from the Bible and from trying to go off of biblical facts as much as possible but where things are uncertain in the bible we tried to just go with realism as much as possible. We thought of what it would really be like to be a real family on an ark like that during a massive flood that was destroying the world and hearing all the people dying outside. We thought of what it would really be like to be in a situation like that and got our inspiration from the script through that thought process. We also wanted to dramatize it a little for entertainment purposes.